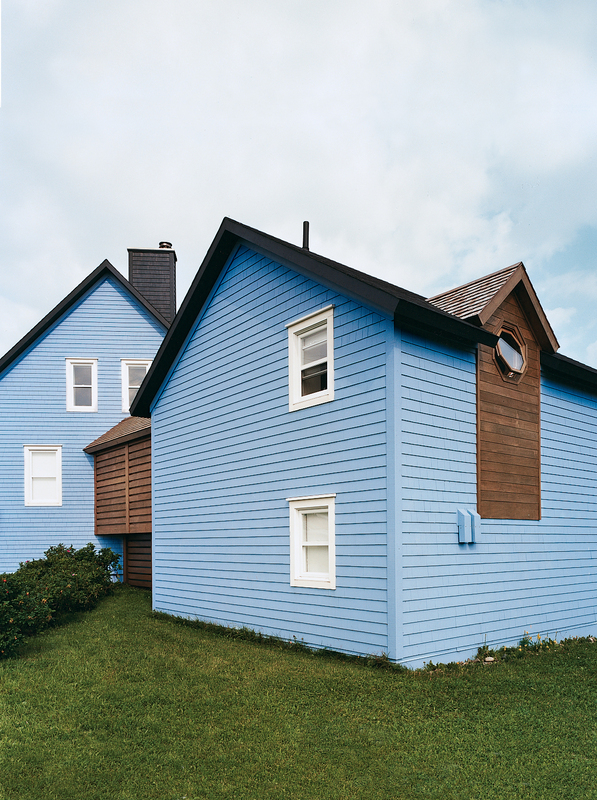 "We wanted something lively for the house, something spectacular but not vulgar," the resident says of the blue hue of his modest 1,690-square-foot seaside Canadian retreat. Montreal firm YH2 settled on a cerulean shade inspired by the sea, the sky, and child’s chalk. The centerpiece of this Bratislava kitchen is the cabinetry: an off-the-rack Ikea system with hacked facing and pulls. The laminate offers a good punch of blue, and in modernist fashion, the resident forwent door handles in favor of cutouts. Glossy six-inch-square blue tiles add color to the kids' bathroom in this Swedish prefab. “They knew they wanted a big kitchen where all of their friends could stand around and be involved in the cooking process,” architect Elizabeth Roberts said of the owners of this renovated Brooklyn townhouse. Exposed beams stripe a ceiling above Wood Mode cabinets painted Newport Green by Benjamin Moore. Two San Francisco art lovers overhauled a loft—and customized a pair of contrasting blue and orange shipping containers—to carve out a guest quarters and home office. The blue entry door of this Lisbon apartment packs a punch in the neutral living area, which is sparsely furnished with inexpensive pieces—some from local Portuguese companies, others self-made or purchased in flea markets. The designers of The William, a Manhattan hotel where every room is a different color, used Old Navy paint from Benjamin Moore to turn the walls of this guest room a deep blue. While shopping for containers, the resident of this San Antonio shipping container home was instantly drawn to this one’s existing blue color and chose to buy it and leave it as is. The architect added floor-to-ceiling sliding doors to allow light in, as well as a cantilevered overhang to shade a window on the left side, which houses a small garden storage area. The upstate New York retreat of a design industry couple features a suite of furniture in navy, including a Michel sectional from B&B Italia and Murphy bed from Resource furniture with deep-blue cushions that, when folded down, give the effect of a lush headboard.